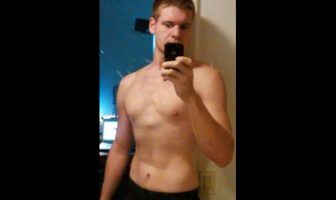 Pounds or Inches Lost: I lost 87 pounds! Hi, my name is Maria Hall. I am 40 years old and I am a physical therapist assistant. I live in Wilkes-Barre, Pennsylvania. My before weight was 210 pounds and my after weight is 128 pounds, I am 5’4″. In April of 2011, my friend asked me to go try out a Zumba class which I was reluctant to do but after she persuaded me to go, I immediately fell in love with it and ended up going 3 days of week. Towards the end of April, the instructor opened her own studio and started offering more classes. At that time I decided that was it, I was sick of my weight and wanted to lose full force. I went on my own diet with an App on my phone counting calories (1,200 calories a day). Jessica Sands, a volunteer instructor at S.W.E.A.T. Fitness Studio, helped me in every sense of my weight journey answering questions I had on food decisions, what classes to take, etc. I really owe it all to her for being my inspiration in this past 8 months, even though she will say it was all me. I am totally in love with eating right and exercising all the time. I take as many classes as I can, sometimes 1-3 classes a day, every day of the week. So after 8 months of losing 72 pounds and dropping from a size 16 to a size 2, I have met the most amazing people ever, and I’m developing friendships I feel will last a lifetime. I am the happiest ever in my life. I finally feel good about the way I look and feel. My husband, Jim, of 18 years and my children, Patrick, 17, and Katie, 13, are very supportive in my new way of life and I wouldn’t be able to do any of this without them either. I am very thankful every day that Jessica took the courage and many pitfalls, even surviving through a flood, to keep her studio open to give me a second home to go to every day to achieve my goal. I love S.W.E.A.T. Fitness Studio, all the instructors and all the friends I have made along the way! Looking at pictures from a concert that I went to April of 2011. Finally found the exercise routine that I loved and felt I was in the right mental capability. Exercising every day and making the lifestyle changes of eating right. It really wasn’t very challenging. 2 months, exercising and watching what I am eating at all times. I am much happier and healthier. ShapeFit’s weight loss success stories are very motivational. Use a phone app to enter food. Have a gym that is like your second home. 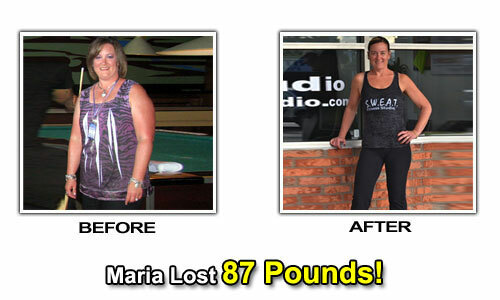 Maria’s Weight Loss Eating Plan! Low fat meals from recipe books. TNT-tighten and tone full body workouts, 3 days a week. 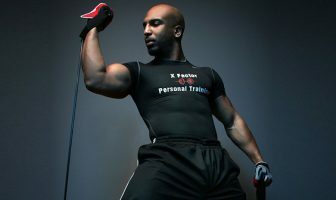 Kickboxing, Zumba or hip hop fitness, 6 days a week.